The very popular Filipino band took their official social media account and posted their reactions on the Anti-DUTERTE Ad. The Eraserheads are questioning the MTRCB, ABS-CBN, GMA, TV5 and radio stations on regards to the said political TV ad. The Admin of the 'Eraserheads' Facebook fan page posted yesterday, May 5, 2016, the message that garnered almost 48 thousands likes, angry and sad emoticons and 20,157 shares as of writing this post. 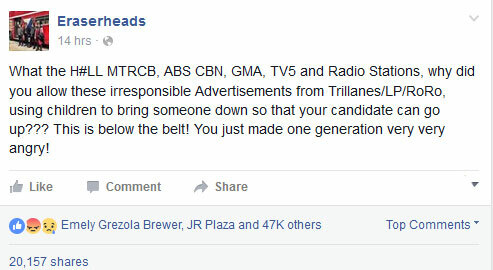 The FB messages said, "What the H#LL MTRCB, ABS CBN, GMA, TV5 and Radio Stations, why did you allow these irresponsible Advertisements from Trillanes/LP/RoRo, using children to bring someone down so that your candidate can go up??? This is below the belt! You just made one generation very very angry!" to provide a forum for the discussion of such issues and events shall be respected. 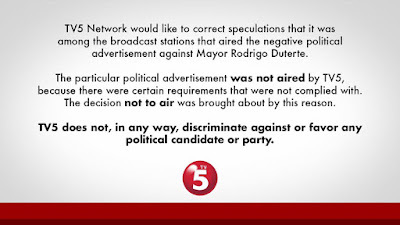 (S)"
However, the TV5 Management already raised their side regarding the 'anti-Duterte Political Ad' and said, "TV5 Network would like to correct speculations that it was among the broadcast stations that aired the negative political advertisement against Mayor Rodrigo Duterte. The particular political advertisement was not aired by TV5 because there were certain requirements that were not complied with. The decision not to air is brought about due to this reason. 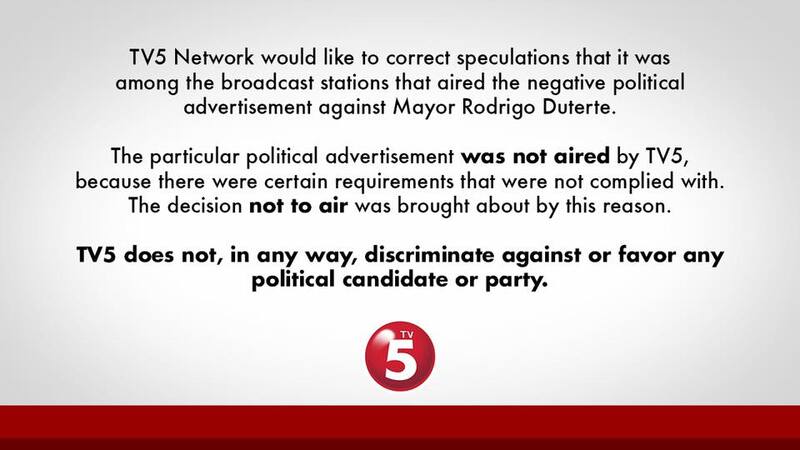 TV5 does not, in any way, discriminate against or favor any political candidate or party." 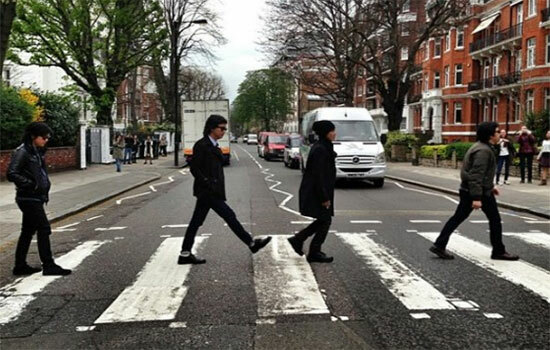 What do you think on Eraserheads statement? Share your thoughts below. Comments or suggestions about "Eraserheads condemning irresponsible Advertisements from Trillanes/LP/RoRo" is important to us, you may share it by using the comment box below.